I have had the privilege of being involved in the teaching and making of art my entire adult life. The pieces in this exhibit span my entire career of making art with clay, from 1967 through the present. I’ve never had a problem coming up with ideas. From humor to protesting wars, any subject is fair game. I love the physicality of clay and the communal experience of working in the ceramic studio. 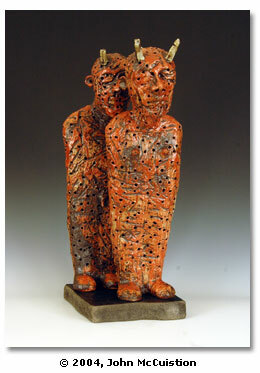 Clay is rewarding and confounding, so it is always a challenge.